Sages derive from the above verse that every Jew is commanded to write a Torah scroll, a commandment that can be fulfilled by writing a single letter of a complete scroll. The Torah may be written only in Ketav Ashurit meaning "Exalted Script." This refers to a special calligraphy that has been transmitted from generation to generation for the specific use of writing Sifrei Torah, Tefillin, and Mezuzot. 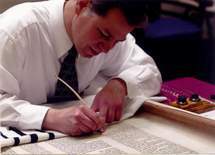 The parchment needs to be processed for the sake of the sanctitiy of making a Sefer Torah. The best parchment is finished to a soft white velvety texture. As the wet ink dries, it attaches itself to the parchment as roots of a tree do to the soil. Parchments written in this manner can last many hundreds of years. The ink needs to be durable, but not indelible. It was originally made from a mixture of soot, gallnut juice, the sap of a tree, honey or pomegranate juice. Today, most Sofers make ink by boiling crushed gallnuts together with gum arabic and copper sulfate. Carbon is also added at times, allowing the ink to dry to a deep shiny black. The shiny black ink on the white parchment alludes to the Torah being given as "black fire on white fire." It was taught: R. Shimon b. Elazar says: the altar was created to prolong one's years, and the sword, to shorten them. Therefore, the shortener may not be lifted over the lengthener (Mechilta). Likewise, a Sefer Torah is intended to bring Life and Peace to the world. Since metal is used to make instruments of war, we abstain from using anything that could be remotely associated with war in the making of our Holy Torah. Sefaradim and Ashkenazim. When writing a Sefer Torah, Sefaradim have traditionally used a reed while Ashkenazim use a quill. The Zohar Hakadosh tells us that the reed was created for writing. With regards to the use of a quill, the important thing is that it comes from a kosher bird such as a turkey or goose. Just as our forefathers cleansed themselves physically and spiritually to receive the Torah at Mount Sinai, the Sofer needs to prepare himself before writing. He does so by immersing in a mikveh and developing pure and proper thoughts. After immersing in the mikveh, the Sofer must begin his writing by saying the following meditation: "I am hereby writing this Scroll of the Torah for the sake of the holiness of the Torah." 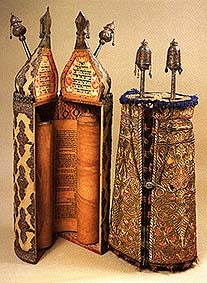 If the scribe does not have this in mind, the Torah scroll may be very beautiful, but it is not a kosher Sefer Torah. As such, it needs to be entombed. Writing Hashem's Holy Name is the most momentous part of writing a Sefer Torah. The Scribe must direct his heart and mind with purity and declare that he is writing each Name for the sake of the sanctity of The Name. If a mistake is done in writing Hashem's name, it cannot be corrected. That particular section of the Torah must be given a dignified burial and entombed. Throughout all our generations, great care was taken to preserve our Holy Torah exactly as it was given by Moses. Since every Torah must be letter perfect, it must be carefully copied from another scroll or Tikun. Like Moses, the Sofer must repeat every word out loud before writing it down, so as to insure accuracy in copying. This was also the custom among the prophets as seen from when Baruch the scribe wrote down the words of Jeremiah.